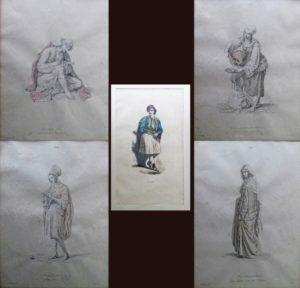 Otto Magnus von Stackelberg, COSTUMES ET USAGES DES PEUPLES DE LA GRÈCE MODERNE, GRAVÉS D’APRÈS LES DESSINS EXÉCUTÉS SUR LES LIEUX EN 1811. These plates of costumes represent Stackelberg’s published work on Greece, where he travelled during 1810-1814. He was in Athens with Byron and he travelled and worked with Cockerell, Haller von Hallerstein, Gropius, Linckh and Foster in excavating various archaeological sites.